Southeastern Style Moccasins - "A Parcel of Strouds, Duffields, Blankets, Silver Trinkets and other suitable Articles for that Trade." 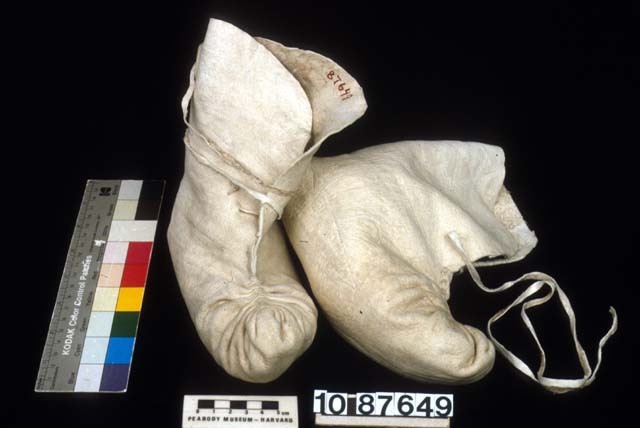 Like most everything else Southeastern, there are few surviving examples of 18th century moccasins. This is not an excuse to use any old moc pattern however, because there are surviving specimins to copy. Even better, there are a bunch of 19th century Seminole mocs which are constructed in a nearly identical manner and people who still know how to make them in the old way. For a long time, David Mott's 2003 moccasin pattern was the only way to go. There really is nothing at all wrong with this basic pattern; after all, my version is rooted in David's work. There are, however, a few details which I feel are important to clarify regarding the "18th" and "19th" century versions. The first pair are labeled Cherokee. 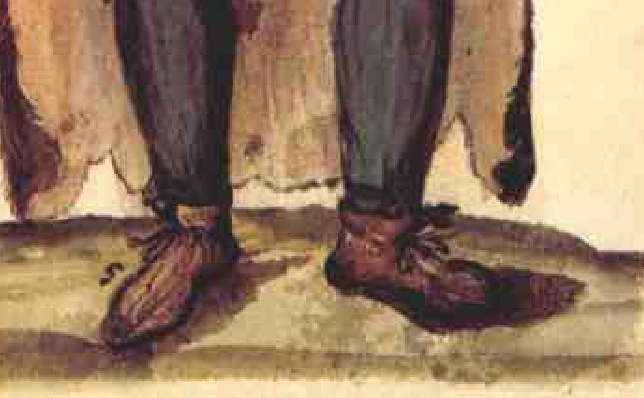 They appear to be puckered all of the way from the toe to the cuffs, as David's instructions illustrate for the 18th century pair. The second pair is labeled Seminole. This pair are clearly constructed in the same way David Mott's directions explain how to make the 19th century pair. Looking at these moccasins, as well as survivors in other museum collections, it is my assertion that the two styles are not indicative of time period. Instead, they show cultural variations. What we are lacking, however, are any examples from the 18th century of moccasin flaps decorated with wool. Therefore it is safe to say that ornamenting the flaps with pieces of wool cloth is incorrect. If one should choose to decorate their mocs, there are surviving examples decorated with silk ribbon, wool tape, white beads, wampum, silk thread embroidery and tin/brass cones with red deer hair. These are the historically safe choices. I would argue that for everyday wear, moccasins should be made without fold down flaps. Instead, they should be made like the above images. The flaps are sewn all the way up in the back and are worn wrapped around the ankle. This very effectively prevents stones, sticks, ticks and anything else from winding up on the inside with your foot! By all means, please follow the pattern illustrated by David! Simply reserve the folded down/decorated flaps for fancy occaisions, but do not ornament them with wool broadcloth! For daily use, wear your plain, undecorated moccasins with the flaps up to keep your feet free from foreign objects. A detail from "James Oglethorpe Presenting the Yamacraw Indians to the Georgia Trustees" by John Verelst. Notice the simple decoration of just the edges and seams. From Oconostota's 1761 French commission. Mocs being worn with the flaps up. 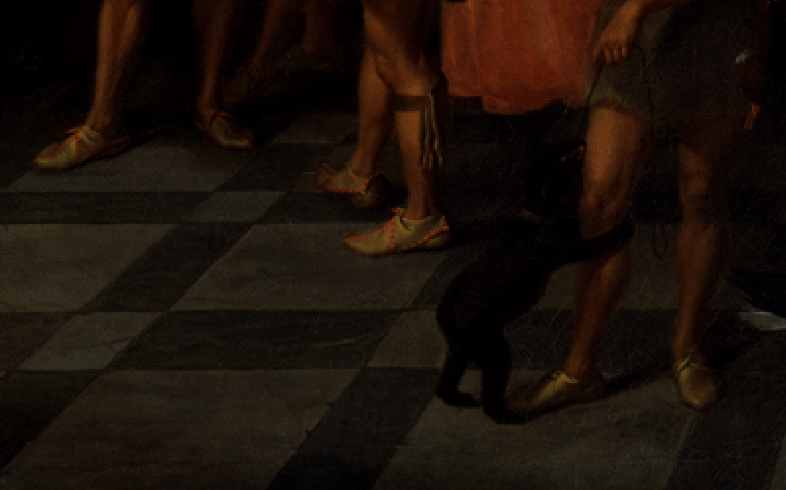 Detail from Philip Georg Friedrich von Reck's "Yuchi Queen and King". The flaps of the mocs are worn up.